Incorporating one New York’s iconic bridges is an integral part of the running experience in New York City. Brooklyn Bridge is a ‘must do’, and does a nice job of accommodating pedestrians. This nearly 4-mile run features the Brooklyn and Manhattan bridges. Note that as you come off the Brooklyn Bridge on the Brooklyn side, you have to continue along the ramp for about 0.5 miles (there’s no ‘quick exit’). 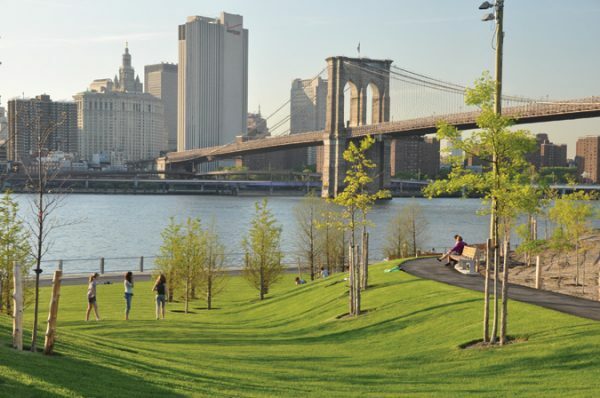 There are numerous ways to incorporate bridges into a route involving the East River Greenway. Add-On Options: On Brooklyn side, Brooklyn Bridge Park out to Pier 5. On Manhattan side, good running along the water. See our waterside running options. Numerous stops nearby. Grand St., Canal St., Chambers St.